A few months ago I was contacted by Dr. Debra Hurwitz, a postdoctoral fellow at the Lunar and Planetary Institute. She was interested in using my Mount Baldy moonrise photo in a graphic that would show how the moon appears from different latitutes. As a committed redneck astrophotographer, I was flattered to have one of my humble images chosen for the project. The finished graphic is above, and you can see it in its native habitat about halfway down this page of resources for International Observe the Moon Night. Thanks, Debra! 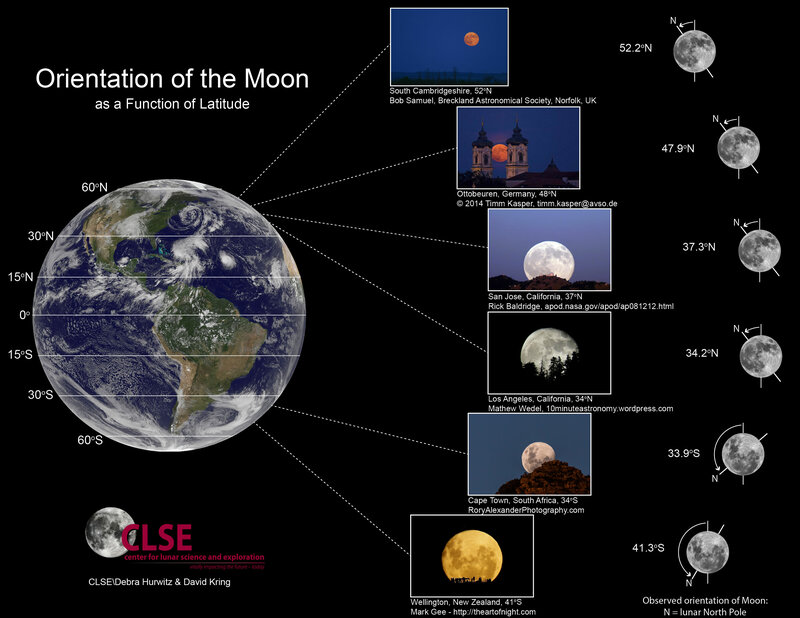 So this makes me wonder…would it be possible to apply photogrammetry to images of the moon taken from various latitudes? I don’t know, but probably. It’s definitely possible to generate stereo-pairs – people have been doing it since 1864. See this post for details.